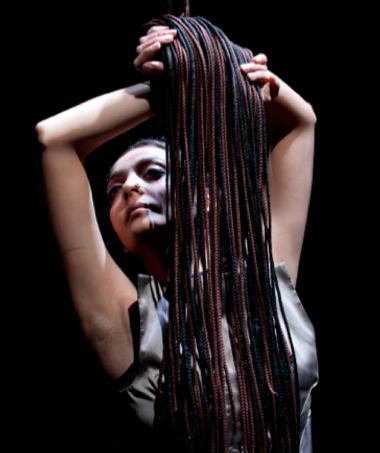 Not Today's Yesterday is an International collaboration between UK award-winning Bharatanatyam artist Seeta Patel and Australian choreographer Lina Limosani. This work blends techniques from Bharatanatyam, contemporary dance & theatre to create a poetic narrative that has the beauty & disquiet of a Grimm's fairy-tale. It is a one-woman show which subversively co-opts whitewashing against itself. "Once upon a time... in a faraway land... it happened... did not happen... could have happened". The inspiration stems from our concerns that revisionist and airbrushed histories have become a central issue of tension throughout the world, in particular in Western democracies. History is being dressed up to make a more readily acceptable narrative for us to consume to the detriment of diverse voices and stories being heard. Britain and Australia, amongst others, have sordid histories and relationships with indigenous and migrant communities. Skewed histories fuel a distorted sense of nationalism. This work aims to open up conversation through a clever appropriation of whitewashed histories and give a voice back to lost histories and communities. Not Today’s Yesterday offers audiences a chance to engage in the most important geo-political conversation of this decade. In light of Brexit, the election of Trump and rise of alt-right ideologies it is more important now than at any time since the 1960s for the voices and perspectives of a diversity of people to be heard, considered and acknowledged as valid within the pluralistic society we say we want.